With today's Summer Sizzler promotion you may find that when freezing prizes through the "categories" tab and checking the "unfreeze prismatic rewards", your bright lamps are still frozen. This is a bug we're aware of. 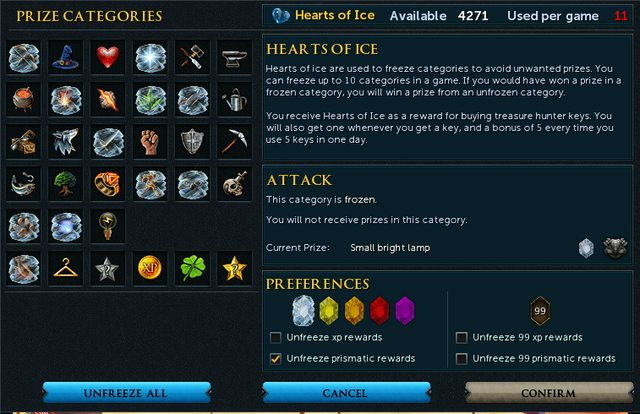 As this is fairly complex to correct it is not something that we'll be able to hotfix, so you should ensure that if you've frozen all of one category with hearts of ice and still wish to get bright lamps, you manually check that all bright lamps are not frozen. This is for the duration of the promotion, up until Monday midnight. Apologies for the inconvenience with this - any questions let me know. What has been changed to make this happen? I mean - This is just the same promo as several times before - How did a bug like this even occur?